The rise of new institutional economics coincided with the growing emphasis by the world development agencies on (good) governance as a panacea. In urban theory, this 'governance' turn witnessed a switch in priorities: a growing emphasis on 'urban goverance' to the neglect of 'urban management'. It was within this context that Governance for Pro-Poor Urban Development was written: to conceptualise, to tease out the key theses of the growing consensus on governance as a 'solution' to both 'problems in cities' and 'problems of cities', and systematically investigate the claims of the many advocates of (good) 'urban governance' as a panacea. According to an extensive assessment by the Editor-in-Chief of the leading journal, Public Administration and Development, '[t]he book makes several contributions to the public administration and urban development debate, particularly related to urban political economy of social justice in Africa and recent ex-colonies'. Since its publication, aside the book's key arguments related to the structural creation of both social differences and differentiation between and within groups as a result of (good) urban governance - findings which pose significant problems of explanation for institutional economics, the book's conceptualisation of 'urban governance' has been well-received. Major studies have been framed around its conception of 'urban governance' and its empirical insights on various sectors of urban society have percolated much subsequent research, including major United Nations and civil society reports. 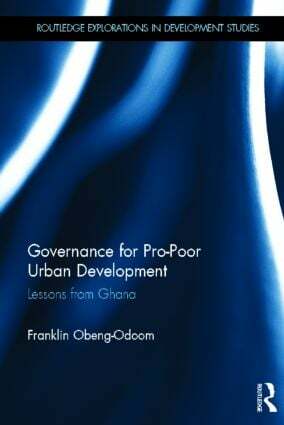 With respect to this book, a review published in the leading journal, International Development Planning Review, notes that '[d]uring the last five years, Franklin Obeng-Odoom has produced a considerable body of research on urban Ghana, and emerged as one of the leading scholars in this particular field of study'. Oiling the Urban Economy, which provides an original spatial critique of the ‘resource curse’ doctrine. On the pages of the Review of Radical Political Economics, Africa's leading resource rent theorist wrote that 'Franklin Obeng-Odoom’s book is significant, especially because of its depth of intellectual rigor, originality, and innovativeness. The skill with which he constructed his heterodox theory for explaining the impact of oil production in the oil-city of Sekondi-Takoradi is simply ingenious'. In the broad context, the book seeks answers to the following questions: In what ways do oil cities come into existence? What changes to property rights are oil prospecting, explorations, and production introducing in the 21st century? How do the effects vary across different social classes and spectrums? To what extent are local and national institutions able to shape, restrain, and constrain trans-national oil-related accumulation and its effects on property in land, property in housing (residential, leisure, and commercial), and property in labour? How do these processes connect with entire urban systems? This book shows how institutions of varying degrees of power interact to govern land, housing, and labour in the city, and analyses how efficient, sustainable, and equitable the outcomes of these interactions are. It is a comprehensive account of the tensions and contradictions in the main sectors of the urban economy, society, and environment in oil cities. The focus of a special issue in the prominent journal, Geography Research Forum, the book will be of interest to urban economists, development economists, real estate economists, Africanists and urbanists. Real Estate, Construction and Economic Development in Emerging Market Economies, on the other hand, is much wider, going beond any particular city. Instead, the book examines the relationships between real estate and construction sectors and explores how each sector, and the relationships between them, affect economic development in emerging market economies (EMEs). Throughout the book, the international team of contributors discuss topics as diverse as real estate finance and investment, housing, property development, construction project management, valuation, sustainability and corporate real estate. In doing so the book demonstrates how the relationship between construction and real estate impacts on economic development in countries such as Argentina, Brazil, Colombia, China, Ghana, Nigeria, Turkey, Lithuania, Hungary and Slovenia. the synergies between construction and real estate and how they, in turn, affect economic development. The subject of a lengthy review by a promient scholar in the field, this book will be of interest to those studying and researching real estate, construction, development studies, urban economics and emerging market economies. Unlike my previous books, Reconstructing Urban Economics seeks to rework the core rules of an entire field. According to one review published in Urban Policy and Research, Reconstructing Urban Economics 'is a significant new book on urban political economic analysis, issues and policy. It considers how cities have usually been analysed in economic theory and presents a different perspective that is more directly engaged with observable processes and problems in the real world. It sets out to take stock of the existing state of knowledge, to challenge it and to reformulate it. This makes it an attractive textbook for a university-level course, but a textbook with a difference because it provides invitation to controversy rather than simply reproducing orthodoxy. It is a book that should also interest practitioners and policy makers, challenging the assumptions that underpin their work in managing urban processes that recurrently generate economic, social and environmental problems'. Well-received by both learned and lay, this book has been described as possessing 'substantial merit', according to a review in The Economic Record. 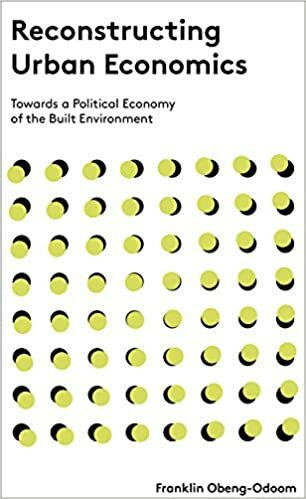 Continuing, the review spells out the nature of this 'merit': [the book] provides a useful set of counter-arguments to the received wisdom on urban economics and the built environment. As such, it has the potential to broaden theoretical and practical perspectives on a topic where quite narrow views often predominate. It aggressively challenges the status quo, and that must be seen as a good thing'. Obeng-Odoom F, 2018/2019, The Myth of Privatising Nature: In Defense of Prosperity and Posterity by Common Property, University of Toronto Press, Toronto.